As you’re getting ready to pop the cork on New Year’s Eve, what nibbles should you serve with the Champagne or other sparkling wine? Here are seven favorite pairings with Champagne. You don’t need the deep pockets for sturgeon caviar. Salmon caviar, trout caviar or whitefish caviar are just dandy. We enjoy serving them in dabs on slices of boiled fingerling potatoes, with a bit of crème fraîche or sour cream between the potato and the caviar. Check out the different types of caviar. Double- and triple-creme cheeses are sumptuous with Champagne. Brie and Camembert are typically* double-crèmes (here’s the difference between Brie and Camembert); triple-crèmes like Brillat-Savarin, Explorateur and St. André are even richer and creamier. Serve slices of fresh baguette or specialty crackers with the cheese. Much as we love Triscuits, for example, New Year’s Eve merits something more glamorous. Brillat-Savarin cheese with Champagne. Photo courtesy Whole Foods Market. Pâte or mousse† de foie gras, made from duck or goose liver, is a classic pairing with Champagne. But chicken mousse pâte is less expensive and equally delicious. You can make it or buy it. We actually prefer mousse to pâte with Champagne because it’s so soft and spreadable. 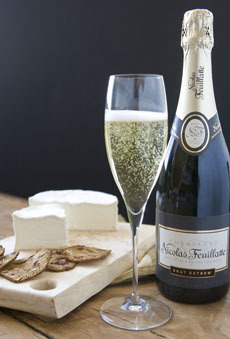 The velvety smooth texture is luxurious against the gentle bubbles. Serve it with toast points or baguette slices. Some of the classic items of the classic plat de fruits de mer—clams, mussels, oysters and shrimp—are delicious with Champagne. You can serve oysters or shrimp only, or a seafood assortment. Seafood tends to be pricey; an alternative is to make a crab or shrimp dip or spread. Smoked salmon is another time-honored marriage with Champagne. Serve it any way you like: canapés, spread (check out these smoked salmon rillettes), even Philadelphia rolls, sushi-style with cream cheese. Champagne can have mushroomy flavors, especially as it ages Stuffed mushrooms go nicely—even if the flavor is citrussy or toasty instead of mushroomy. For something a bit different, consider a platter of sushi—nigiri and/or cut rolls. Like the raw bar, raw fish with rice is delicious with Champagne. For color and flavor, you need only tuna and salmon; but you can get as elaborate as you like. 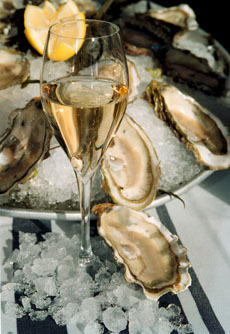 What’s your favorite appetizer to serve with Champagne? Let us know! *Some Bries and Camemberts are triple-crèmes. Pâte is more solid than mousse. Here is Emeril Lagasse’s recipe. For a mousse, the liver is whipped with butter and cream and is soft and spreadable. Here’s a recipe from Alton Brown.